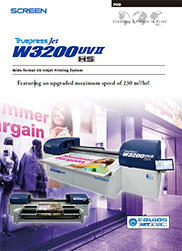 Truepress Jet W3200UVII HS | SCREEN Graphic Solutions Co., Ltd. 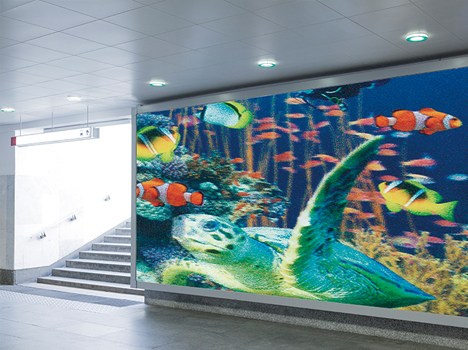 High-speed printing of large-scale lenticular outputLenticular printing can be used to produce various high-impact 2D and 3D effects that create the feeling objects are literally jumping out of printed media or patterns are changing and moving. With their high-definition flatbeds and outstanding speed, Truepress Jet W3200UVII HS systems make it practical to take on previously time-consuming and unrealistic large-size lenticular jobs as regular work. A new level of expression with matte and silk modes UV curing has the unique ability to create a matte finish when performed quickly and gloss finish when performed slowly. The Truepress Jet W3200UVII HS series takes advantage of this feature by using its proprietary UV lamp shutter to precisely control the exposure timing of the UV lamp. This enables the creation of matte or silk finish textures whenever required. Adoption of a multi-layer function as a standard featureA multi-layer function providing precise overprinting of up to eight layers is now installed as a standard feature. The new function allows each layer to be set individually with the most suitable print mode. This improves productivity and enables each job to be output at optimum quality. Thanks to their high-definition flat bed mechanisms and outstanding productivity, Truepress Jet W3200UVII HS systems make it possible to take on previously unrealistic large-size multi-layer jobs as regular work. We are helping our customers to build stronger market shares in the rapidly expanding field of cardboard printing using large format inkjet systems. We are also enabling them to achieve greater profitability in product businesses including retail displays, high-impact packages and shelf-ready packaging. 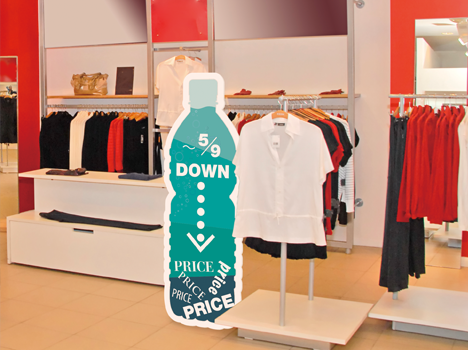 In-store sales promotions provide increased product competitiveness and differentiation that can turn uninterested consumers into purchasers. 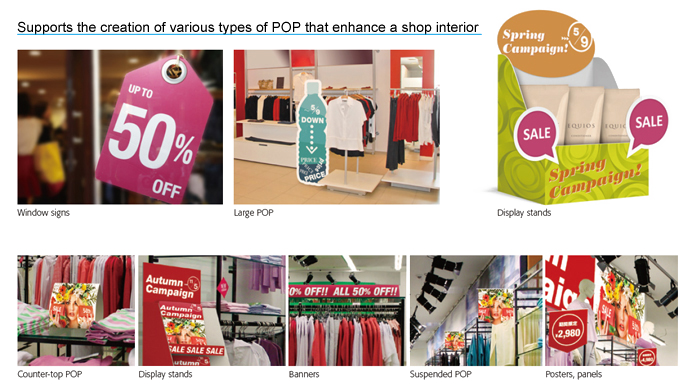 Promotional displays are a major factor in smoothly directing the buying process. 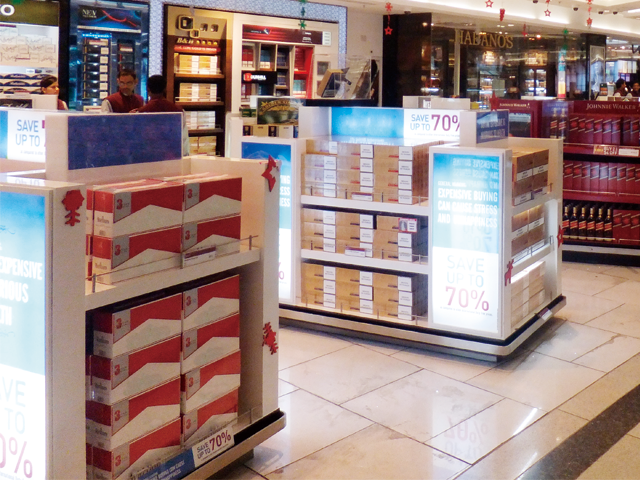 For this reason, many stores hire specialized consultants to help create displays that are more friendly and appealing for customers. 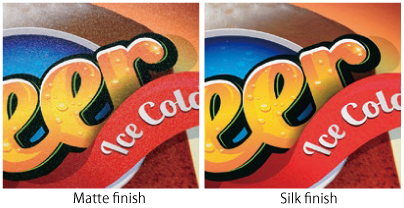 SCREEN UV inkjet systems are the key to maximizing the impact of these designs. They allow the reproduction of photos, logos and other items that are completely true to their original form. Images are so real they seem ready to jump off the display. Graphics pros, particularly those who work with images, are frequently required to create custom banners and signs that must be perfect in every detail. SCREEN wide format inkjet solutions eliminate these worries.